Delta Force Paintball, the world’s largest operator of paintball games, is adding another incredible entry to our catalogue of paintball centres with the launch of Monarto Paintball only weeks away! 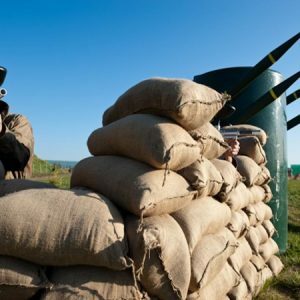 Situated less than an hour away from the CBD, the paintball centre is easily accessible along the South Eastern Freeway, bringing world-class action-packed paintball to residents and visitors of Adelaide and surrounding suburbs. 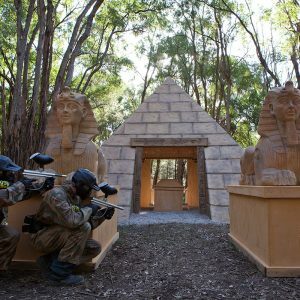 The highlight of Monarto Paintball would have to be Tomb Raider, a quality game zone that consists of a huge pyramid and guarding sphinxes. Your objective is to capture the ancient artefacts, which lie in the heart of the pyramid, before they fall into the wrong hands. Get into the tomb, secure the artefact and use the giant sphinxes as cover to escape. Do you have what it takes? 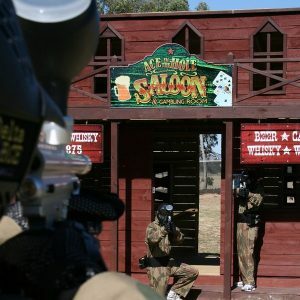 With the signature Delta Force game zone of Tomb Raider being the main focus, other inspiring game zones such as London After the Apocalypse, Tropic Thunder and Resident Evil will also bring a breath of fresh air to the South Australian paintball scene. Many of these game zones are new to Australian shores, bringing with them the European flair that Delta Force customers are used to enjoying. Our game zone development and construction team (yes, that job exists!) have been hard at work ensuring that the scenarios are as fun and exciting as possible.